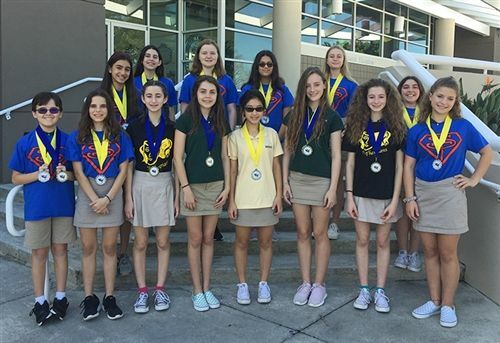 A total of 16 qualifying students from Shorecrest Middle School attended the Florida State Junior Thespian Festival. Currently, our state has more Jr. Thespian troupes than any other nationwide, making competition tough in each category. With nearly 5000 registrants from across 12 districts, this event is held in an amazing and colossal venue, the Orange County Convention Center, Orlando. Students left school early on Thursday in order to attend the Opening Ceremony showcasing the Districts' 12 Best in Show performances. Thespians hit the ground running on Friday morning to take their choice of workshops from 24 various special guest artists and designers. Workshops included, "Are You Ready for Your Callback?" by Director/Actor/Coach Aaron Jackson, "Casting: It's more than just talent!" by Disney Entertainment Manager Hans Weichhart, "Hamilton Dance Workshop", "Playwriting" with Don Zolidis (author of Alissa S's monologue... and she had the honor of meeting him! ), and one of the most popular workshops for MS students each year, "Stage Combat" with Ted Lewis. On Friday evening, students were treated to the mainstage production of "Addams Family the Musical" in the Chapin Theatre. An early warm-up, rehearsal, and coaching session by Mr. Lowe and Mrs. McCarthy on Saturday morning set them up to head into the competition rooms where our students gave their performances in front of judging panels throughout the day. Once all events were completed and the judging critiques were received, Troupe 88197 holds a T-Shirt Ceremony. Whether anyone received an award or not, students are always excited to earn a State Festival T-Shirt!! The event wrapped up with the Closing Ceremony in the Chapin Theatre where all students are treated to the State winning performances. This year was quite special as we had the chance to have our own Troupe represented on stage by Sofia A and Jolie B who won Critics Choice (highest honor) for their duet. Final results found Troupe 88197 with 1 State level Critics Choice, 5 Superior medals, and 15 Excellent medals! The highlight for Mrs. McCarthy was being approached on three separate occasions by other troupe directors and by Aaron Jackson, a professional director, to be told how impressed they were with the professionalism shown by members of Troupe 88197. Well done to everyone who attended; especially the parent chaperones who don't often find themselves amongst 5000 middle school students! Duet Acting - STATE SUPERIOR & CRITICS CHOICE!! "Human Stuff" The Little Mermaid Jr.